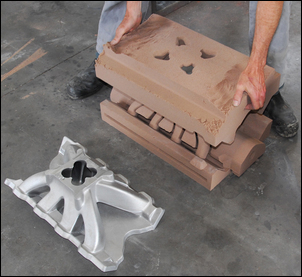 From simple to complex - sand casting metals in aluminium. There are two really good reasons to know about metal casting. The first is that knowledge of metal casting will allow you to better understand how items are produced, and consequently what the limitations and benefits of this process are. Simply, you’ll be able to look at castings with a much more educated eye. 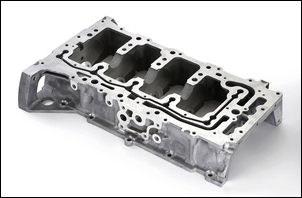 The second reason to know about metal casting is that you may be able to use castings in your own car modifications. If the item is to be made in batches as small as even five, castings can have a major benefit over fabrication (eg by welding) or machining (eg on a computer-controlled machining centre). Those benefits can be in terms of appearance, strength and cost. In this three-part series we’ll be concentrating on casting in aluminium. Aluminium is easily cast, easily machined and (depending on the grade) can be heat-treated for additional strength. Aluminium castings won’t rust, can be powder-coated or painted, and are light. In this article, Part 1, we’ll look at the background to casting, and specifically sand casting – the cheapest and easiest way of producing small runs of a casting. We’ll look at patterns and moulds. In Part 2 we will cover the step-by-step making of a sand mould from a pattern, using a fairly complex casting as the example – the production of an aftermarket intake manifold. Finally, in Part 3, we’ll watch the pouring of the intake manifold, from the liquid aluminium entering the mould to the casting finished and ready to be sent off for machining. So jump on for the ride. 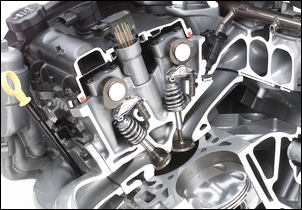 I found the process quite fascinating, and it was an amazing experience watching the pouring of the inlet manifold. When one is used to idea that metal is a hard substance that can be cut, filed or machined, watching it suddenly flow like water takes your breath away! Patterns and moulds can become complex very quickly, so let’s start with the absolute simplest. 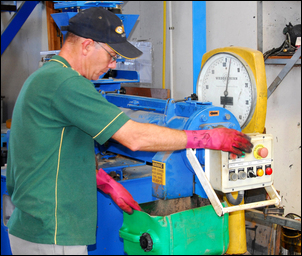 The fundamental process followed in sand casting is the creation of an impression in sand into which the molten metal is poured. The sand that is used goes hard after the impression has been made. The sand can be a naturally occurring sand of an appropriate moisture content that is poured damp (ie soft), or as is almost always the case these days, it can be a silica sand containing binders and other chemicals that cause the sand to harden after it is exposed to air, and to go very hard when subjected to the heat of the casting process. With the latter type of sand, the binding chemicals are mixed with the sand as it is dispensed from a special machine (pictured). To create the correctly-shaped impression in the sand, a pattern is used. In its simplest form, the pattern looks like the outside shape of the finished casting. Let’s take a look. Here is the finished product – a small wheel. 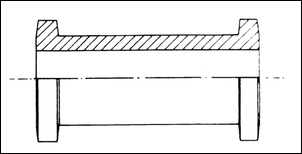 The pattern for the casting is shown here. Note that even on this simplest of patterns, tapers have to be used so that the pattern will be able to be removed from the moulded sand without damaging the shape in the sand. As we will see next week, in more complex castings, the patterns may have to be made with separate parts so that they can be removed after moulding. The pattern is placed in the moulding box (usually made of wood although steel or aluminium can also be used) and sand is packed around the pattern. Patterns can be made from plastic, wood or steel. 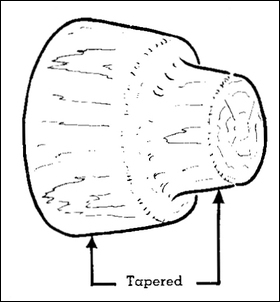 Wood is most often used. The pattern is removed from the moulding box, leaving its impression behind. (You can now see the need for the tapers on the pattern; a normal taper is 1.5 per cent.) The sand hardens, developing the strength to withstand the force of molten metal being poured into it. 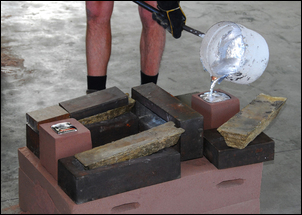 The molten metal is poured into the mould, the metal flowing and so taking the shape of the impression in the sand. The metal cools and hardens and then the sand is broken away, allowing the casting to be removed. 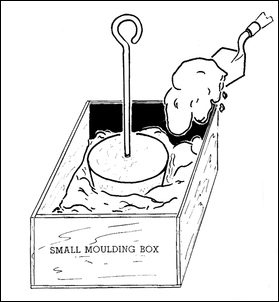 (Sand moulds are used just once.) 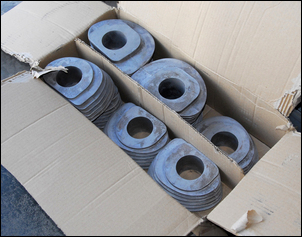 In this case, quite a lot of machining will be needed before the casting looks like the finished product, the wheel. 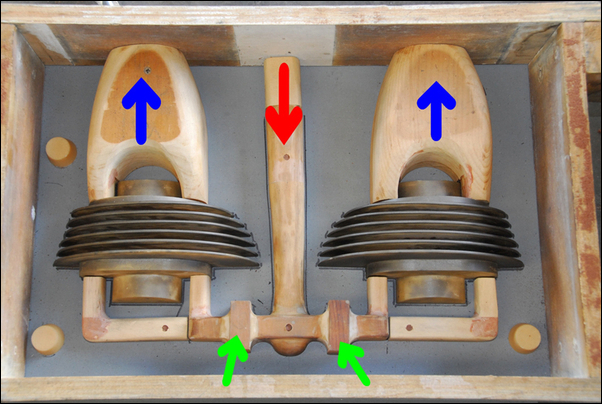 Let’s take a look at another casting, but this time make the mould in two pieces and add the metal-flowing passages. Here the pattern has been placed in the wood moulding box. 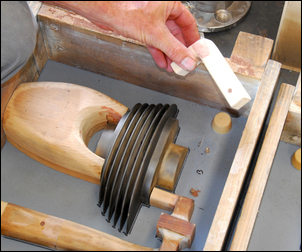 Now we see the first difference in this process – another moulding box has been placed on top and two tapered pins have been placed in position. These pins act as ‘mini patterns’, giving shape to the passages that will be formed through the sand. 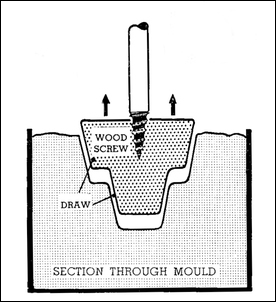 If you look closely at the above diagram, you’ll see that the runner (sprue) and riser don’t actually connect to the moulded impression left by the pattern. This is remedied with these impressions made in the sand. Here is the finished, assembled mould. The top part of the mould is called the ‘cope’ and the bottom part, the ‘drag’. The runner (where the metal will be added), the riser (where metal will rise) and the connecting passages to the part of the mould where the casting will be created can all be seen. 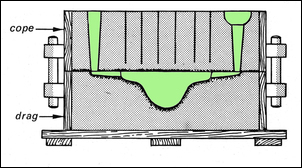 This is the same diagram as above but the green colour has been added to show where the metal ends up. 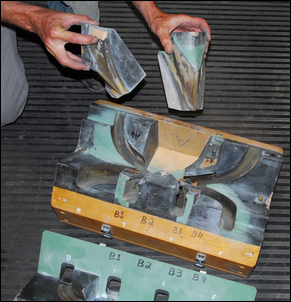 As can be seen, quite a lot of poured (and then solidified) metal is surplus to the required casting – after the sand is removed from around the casting, these surplus parts need to be cut off. 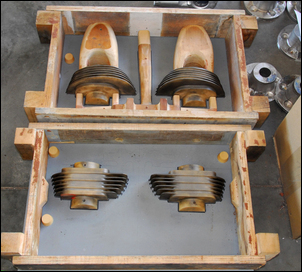 The moulds that we’ve seen formed so far have resulted in castings that are solid. 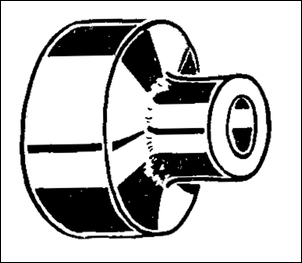 The small wheel produced in the first example of casting described above not only needs to have its external diameter machined in a lathe, but it also needs to have a hole drilled through it for the axle. 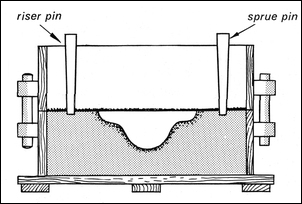 But forming the internal opening at the time the casting is made has two major advantages – it saves in waste material and, much more importantly, complex shape internal openings can be formed. 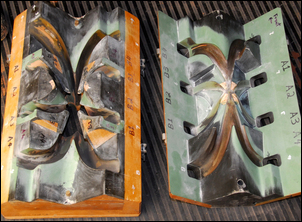 In many castings, such as this cylinder head, forming the internal openings by machining after the casting was complete would be impossible. 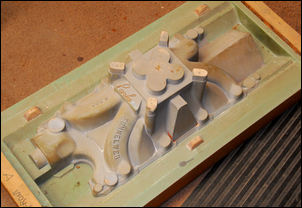 The openings and passages within a casting are also formed by shaped sand; these pieces of the mould are called ‘cores’. 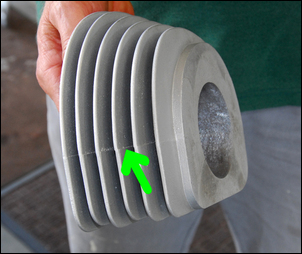 When picturing the required shape of a core, think of it like this: the core is shaped the same way as the air space inside the casting. 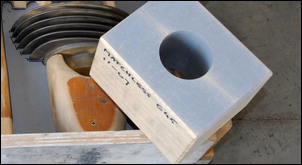 Cores are produced in their own patterns (more correctly called ‘core boxes’) before being inserted inside the main sand mould. Let’s take a look. Here is the desired finished product. 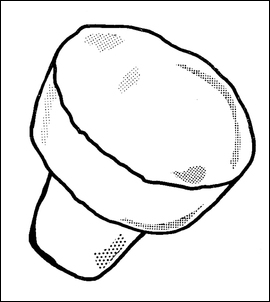 This is a semi cutaway view – what is wanted is a casting that looks rather like a cotton reel. 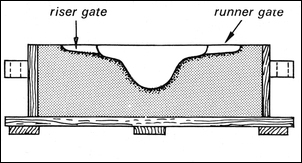 A cylindrical opening through the middle of the casting is needed, so a core of hard sand is required to form this opening. This core is created in its own pattern – a core box. The core box is in two halves (remember, the sand core needs to be able to be removed undamaged) and sand can be inserted into the core box through one end. The wooden pattern for the external shape of the casting is formed in two halves. One half goes in the top half of the mould (the cope) and the other half goes in the bottom section of the mould (the drag). The parting line (ie the separation point of the mould) is halfway up the side of the ‘cotton reel’ shape. Here is the full mould. The core piece is coloured orange and where the metal will flow is green. 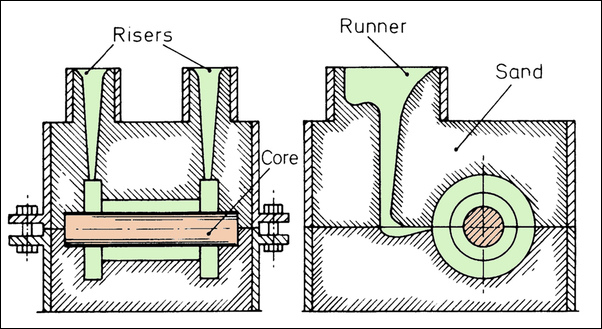 This drawing summarises all that we’ve covered – a sand mould made in two halves, a runner, risers, and a core piece. 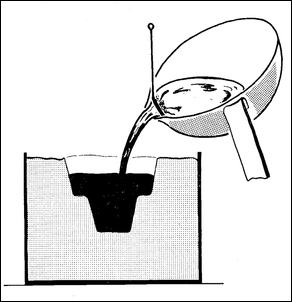 Here is an example of a simple casting – a motorcycle cylinder barrel. Look closely at the pic (click on it to enlarge). 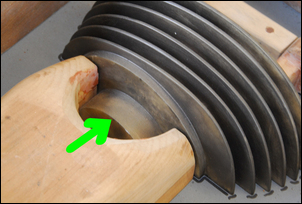 The cylinder barrel has a big opening through the middle of it – so the mould must have used a core. Furthermore, as with the ‘cotton reel’ casting described above, it must have been made using a two-piece mould. Look closely and you can see the parting line of the mould replicated on the casting (arrowed). But what about the core pieces? As shown here, this part of the pattern (when it’s left its impression in the sand mould) would simply make the central part of the casting solid. But here’s the core box. 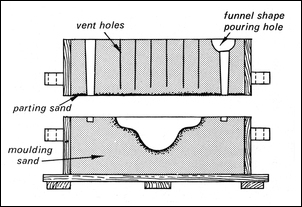 The core box in this case is required to form only a cylinder of sand, one that can be located in the middle of the sand mould to prevent metal filling the middle of the casting. Therefore, this core box is very simple. Here are both halves of the pattern, minus the core box. As can be seen, the runner and risers are incorporated in only one side of the pattern. 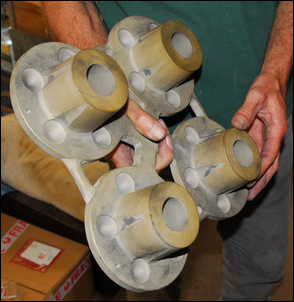 The completed castings ready for machining. Before finishing, let’s take a look at some more patterns. 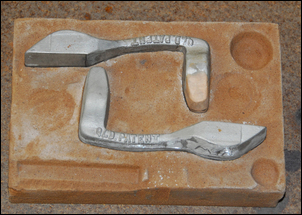 ...and this shows the patterns for two metal-working tools resting in half of the sand mould. Note how these patterns are made of metal and some added body filler. Finally, giving us a taste of what we will see in Part 2 of this series, here are some of the patterns for an aftermarket carby intake manifold. ... with removable parts to allow the core to be extracted complete. What seems a very simple idea - just create an impression in sand and then pour the metal into it – becomes increasingly complex when the intricacies of shapes, openings and internal passages are taken into account. However, once you get a fundamental understanding, the rest, er, flows from there.